One of the biggest challenges for school leaders is trying to determine how to motivate teachers and keep them engaged and growing in the education profession year after year. We typically think of motivation as a stable characteristic. Either teachers are motivated or they’re not. That’s not the case. Motivation is something that is built and maintained within individuals. Teachers who are struggling today could later become some of the most dedicated teachers on staff. The opposite is also true. Teachers who are creative and engaged today, could lose their zeal and struggle to adapt to changes. Motivated teachers are more creative, productive, and help students achieve higher learning outcomes than those who are less motivated (Tschannen-Moran & Hoy 2001). When motivation is nurtured and planned as part of a strategic plan, teachers excel. When motivation is left to chance, educators who love the profession can lose their passion for the profession. A recent conversation with a friend and former colleague illustrates this point and also reminded me the answer for how to motivate teachers may have been hidden in our freshman year of college. My friend recently transferred to a new school district. In his previous position he was highly motivated, led collaborative committees among his peers to affect change, and used innovative approaches to solve challenges. In his new position, he feels timid, isolated and unsure of himself. I wondered what change had occurred that was preventing him feeling motivated and able to contribute at the same level he did in his previous position. I told him I was working on another article dealing with how to motivate teachers and people working in the education profession. I asked him what he thought had changed in the past year that was affecting his motivation. He said the change in job tasks made him feel less competent than before. In the past, he felt he had a mastery level of knowledge, but the different expectations and tasks in his new position left him feeling ill-equipped for the job. He explained that his work space was disconnected from his peers. He added the regimented structure of his job made him feel micromanaged as if the organization didn’t trust his judgement. He explained these factors were consuming his thoughts through the day were like barriers to him becoming as motivated and creative as he was in his previous position. As I listened I thought, “No kidding? This is Psychology 101.” It was a classic case of Maslow’s Hierarchy of Needs. This 70-year-old psychology graphic organizer, when considered through the lens of education, can help school leaders identify barriers to engagement as they try to determine how to motivate teachers and keep them engaged year after year. A quick refresher on Maslow’s theory. In the early 1940s, Abraham Maslow theorized that human needs at the lower level had to be met before higher levels of motivation could be achieved. For example, people are unlikely to have feelings of self-efficacy (at the 4th level of self-esteem) if security needs, such as feelings of competence (at the 2nd level) are not met. Essentially, lower levels in the hierarchy are the building blocks to achieve higher levels of functioning and motivation. As any school leader is aware, schools need educators who have reached the level of self-actualization. This is the level where teachers become creative, integrate, are reflective in their own practice, and pursue opportunities to grow in the profession. School districts need to develop plans to move teachers through these levels early in the employment process and maintain the highest levels as a part of organizational design. 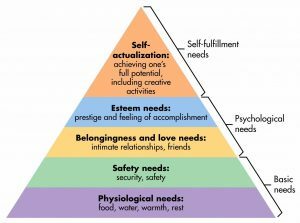 Physiological– Feelings related to the most basic needs. Adequate lunch breaks/ planning period, work-life balance, a living wage, and comprehensive insurance coverage. Security– Feelings of personal safety at work, awareness and ability to perform essential job functions at a basic level, job security, retirement (generally for more tenured staff), stability and structure in district and school leadership, common expectations, and well-designed change efforts. Belonging– Feelings of cohesiveness among faculty and staff, shared values and goals for the district and community, inclusive social interactions, positive relationship with supervisors and organizational leaders, the opportunity to develop new relationships with community and district stakeholders, included in the school/ district decision making process, and included in communication efforts that affect the school employees job. Self-Esteem– Feelings of self-efficacy, recognition that one is proficient in the essential skills required on the job, opportunity to develop mastery in core competencies, assignment to special committees/ projects, and autonomy to design instruction and learning experiences. Self-Actualization– Feelings of mastery related core job responsibilities. Creative lessons that integrate content areas and methods of instruction. The opportunity to serve as a mentor, pursue self-development personally as well as professionally, and pursuing the opportunity to take on more challenging leadership opportunities within the organization and profession. School districts that may be wondering how to motivate teachers must ensure they are creating conditions within their human resource procedures that are more likely to produce motivated teachers. Selection Processes- This seems obvious, but hire people with the skills needed for the job. Too often, applicants with a nice personality and a seemingly good “fit” are hired without verifying they can perform essential functions on the job. The most essential function of the teacher selection process is to ensure job candidate possess the skills necessary to perform well on the job. If new teachers do not feel competent in performing essential functions of the job (instruction, lesson design, classroom management) they will feel insecure in their work and move slowly through the hierarchy or worse, quit after a year or two on the job. Additionally, schools need to work to provide competitive salaries based on the cost of living for the area near the school district. Budget to provide salary increases that at follow rises in the cost of living. In states or localities where funding and salary increases have been lean, explore ways to offset common expenses teachers face such as housing assistance. Onboarding One of the most critical portions of an effective school district onboarding process is establishing mentor relationships and teaching new staff members how to access and use essential job resources. District human resource staff can also be helpful in articulating considerations related to insurance and benefit choices and how they can be used to both save employees money as well as provide coverage for common and critical health related issues that can affect both feelings of physical health and security. Onboarding can also be an opportunity to provide information about the personal and professional resources the district has to offer. Climate Surveys and Exit Surveys– Employee surveys can serve as a barometer for motivation. We develop climate surveys that align to factors at all levels of the hierarchy and provide insights on how well school districts are building the basic foundations that help employees feel motivated and engaged. Our exit surveys are aligned to climate surveys to provide indicators of factors that may be causing turnover. When used correctly, school leaders can develop action plans and monitor factors that indicate when staff members may be becoming disengaged. These can be used to improve teacher engagement and reduce turnover. Professional Development– For a profession that spends the majority of its time teaching students, school districts actually do a pretty poor job of professional development. Teachers are asked to ensure lecture time is short and students have an opportunity to apply what they are learning and receive feedback during the learning process. “Sit and get” instruction is deemed largely ineffective. However, en masse marathon sessions of professional development for teachers with little or no opportunity for practice and feedback is typically the norm rather than the exception in many school districts. Effective, well-designed professional development is the most reliable way to ensure engaged and self-actualized teachers. Employee development is related to every level of Maslow’s Hierarchy, but is most critical at the higher stages of self-esteem and self-actualization. Teachers who are motivated feel they have the knowledge and skills to be effective in essential tasks and are more likely to reach self-actualization. Motivating teachers is a never ending challenge. The ever-changing landscape of education presents endless opportunities to engage and frustrate teachers. School districts must ensure efforts to motivate teachers are integrated into their human resource processes. We have developed a complete ebook to provide further guidance on how to motivate teachers using principles of organizational psychology. If motivated teachers are one of the most important organizational factors related to improved student outcomes, school districts need a well-developed plan. Find out how to get a copy of Ignite: A School Administrator’s Guide to Designing Districts that Motivate Teachers.